A short while ago, I was on a guided fly fishing trip with Andy who is a novice fly fisherman. On an early autumn day in September, I was going on a guided fly fishing trip with Andy. The season was already close to its end and the temperatures began to plummet to chilly 8 degrees Celsius over the night . While driving to the northern mountain range of Switzerland, called Jura, I explained Andy that I cannot guarantee him to catch any fish. However, this was my personal goal for today. In contrast to not being able to guarantee a catch, I told him that if we hook a trout, there will be definitely some lost fish too. With this in mind, we ventured through forest, tunnels and mountain passes to our destination. After some practise casting on a meadow and teaching again some basics, we headed off to the small creek. There the casting style was totally different due to low hanging branches as well as no space for any backcasts. Thus, we used mostly roll and bow-and-arrow casts. At the river, I checked some stones for insect. There, I discovered what I was looking for – the answer to the food source of the trout. The huge stonefly was about 3 cm long and had a tan colour. A quick look into my fly box and I knew what to use as nymph. The wired stonefly nymph. 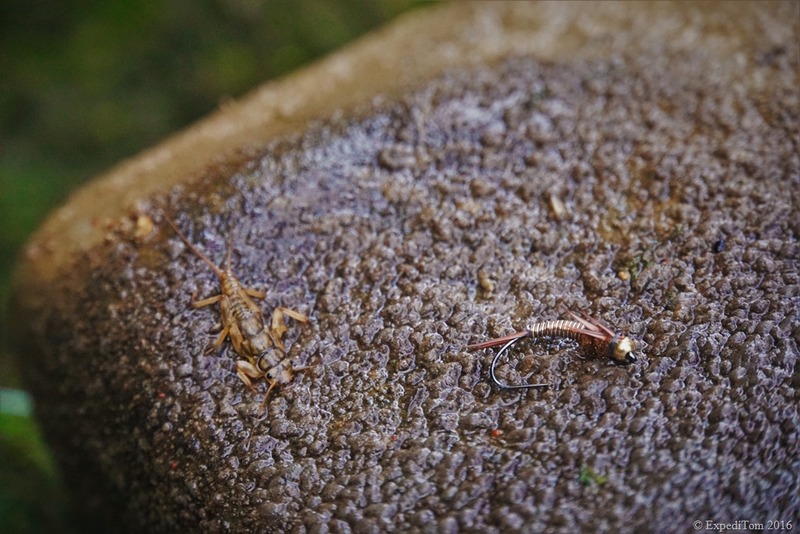 Whereas we rigged the first rod with an indicator-nymph rig, the other rod was prepared to cast dry flies. This kind of rigging 2 rods differently is very useful in small creeks where only one person can fish at a time. The two different rigs allow us to switch rod and adapt swiftly to the preference of the fish. […] something happened I had never seen before. The guided fly fishing trip with Andy started at one of my favourite pools. 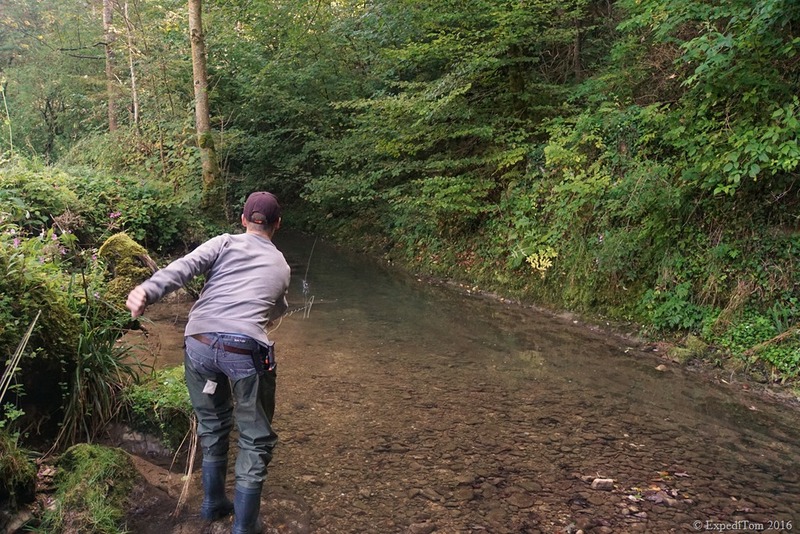 It is the same as we had been during the fly fishing a Jura mountain creek trip. 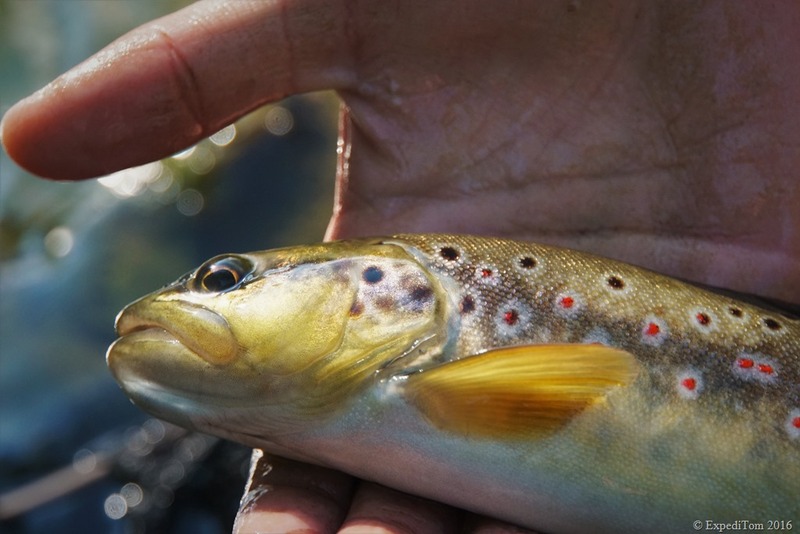 There we saw several small trout of which some of them we spooked. Shortly after, something happened I had never seen before. A larger trout swam to the end of the pool where Andy and I stood. We did not dare to move because we were as close as 2 metres. 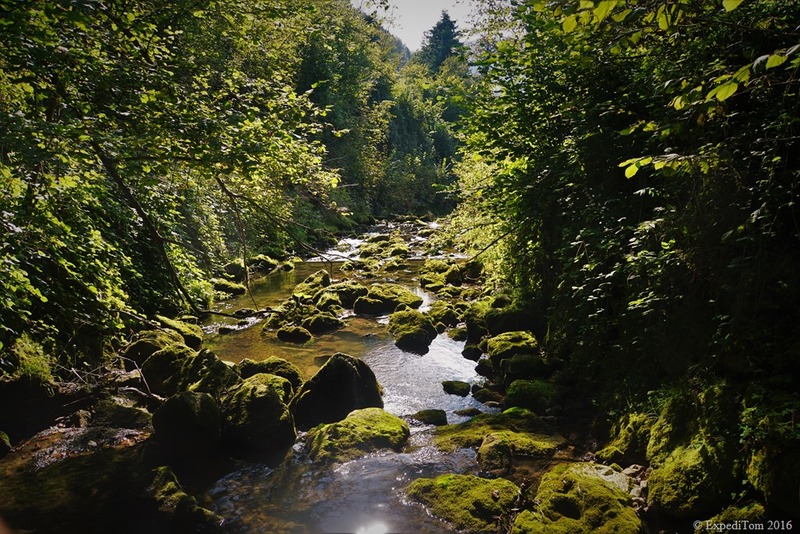 Andy and I were even more astonished, when the trout suddenly hastened to the surface and jumped out of the water. We assume the trout ate a fly or an emerger but neither of us did see what kind of exactly. The trout then gently swam upstream out of sight. … however, Andy did a bloody good job. The stop could have been earlier, so the line would not land first on the water. Being extremely astonished, we switched the rod to the dry fly rig. Still wondering whether the trout had seen us or not, I tied on a tiny size 18 Royal Wulff. I decided to go small, because we did not see any insects on the surface. Yet, it could have been as well an ermerger. Still the trout had risen eagerly. Andy casted then the dry as far as he was able to. The Royal Wulff drifted several times through half the length of the pool but no trout rose. Then Andy offered me to cast the rod in order to fish the whole length of the pool, because he was not able to cast that far. Two casts and some spectacular jumps (of the fish) later, the first trout of the day was landed. As usual, we had as well some inevitable snags in branches during this guided fly fishing trip with Andy. For example, at the next pool where we headed to. The pool was a bit shorter in length, but even deeper. We sneaked up on all fours, to avoid a human silhouette. As we reached our hiding place a few metres below, we both kneeled on the gravel and Andy tried to do a roll cast. Unfortunately, the branches above our heads were in the way. Luckily, he was able to solve it by pulling gently the line back. After this, we tried a bow-and-arrow cast, where I held the fly behind Andy in order to reach even further. It proofed to be more difficult than anticipated. Yet, on pictures it looks so easy to do a bow-and-arrow cast together. After this pool, which was pretty demanding concerning casting, we headed to a spot where one has to venture quite a while. But walking the extra mile is not only in New Zealand key, but in Switzerland too. Usually, the further you walk to a spot, the lesser the angler pressure is. Therefore, the fishing becomes recognisably better. I was glad that it was a guided fly fishing trip with Andy, because he is of the same sort of man as I am: an outdoor enthusiast without comparison. It goes without saying, that he was totally fine with hiking the extra mile and even climb at some stage. So we headed off to some fabulous fishing spots. In so far, Andy had not caught a fish on a fly yet, neither during previous fly fishing adventures. Thus, my goal was to help Andy to catch a fish. To achieve this, I decided not to fish anymore as long as he did not land one. So I did not take away any opportunities. We climbed several smaller waterfalls of this little creek and we fished each pool we expected to contain a trout. Thereby, the wired stonefly nymph proofed to be more successful than the dry. Andy hooked 9 fish. However, he had some issues with striping in the fly line while having a fish hooked. Subsequently, he lost all trout due to slack line, trout unhooking under branches or stones and missed takes. Then we had a break. I tried to give some advice on the basics how to land a trout with a fly rod. This was way more difficult to explain than I expected. Afterwards, Andy and I packed our backpacks again and continued our journey. 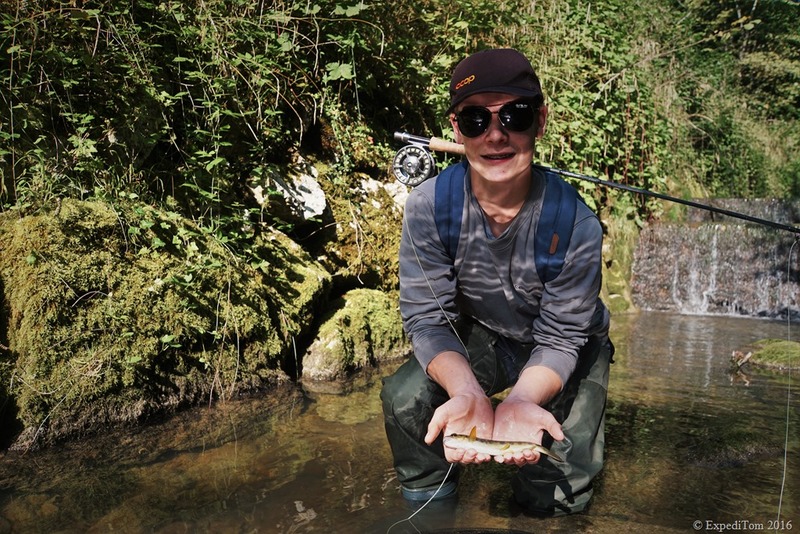 Shortly after, Andy finally landed his very first trout. Well done! We pushed further through a narrow gorge and I was glad that I achieved my goal to make him land a fish on a fly. Especially, because now I could fish again. The last few pools produced some more fish and I lost a few too. It was already late in the afternoon, nevertheless we decided to change to another river. There, I wanted to explore some spots, which I have not fished before and finish the day at one of my favourite spots called ‘honey-hole’. The first stretch of the other river, which Andy and I explored, was unsuccessful. We had seen some fish but as it often is while exploring new stretches of water: one does not know the hiding spots of the fish, until you stand too close. Thus, we spooked several fish. Further upstream, my beloved ‘honey-hole’ awaited us. Or should I say Andy? Because I had fished this spot on various occasions. Subsequently, I let Andy do the job. He took the rod with the indicator-nymph rig. Then we sneaked upon the small pool. As soon as we were close enough to cast into to pool we stopped. It took several roll cast until the nymph drifted superbly through the pool. A sudden sinking of the indicator showed the first bite which Andy unfortunately messed up. However, the next bite was not long and he hooked and landed the next fish successfully. It was a decent sized fish, which he was really happy about as one can see at his winner smile. However, what happened next was a sad story. However, what happened next was a sad story. Andy continued fishing and hooked a really good trout, which might have been even 40 cm. Andy tried to pull it back and the trout went the other way. Only seconds later the line broke and the fish got away. Hastily, I had a look at the broken leader. Luckily, it was not broken because of a bad knot, but I had a suspicion what caused the fault. I forgot to change the rig to stronger tippet material after the first creek. Instead we had fished with 7x tippet which is sufficient for the first little creek. However, the second river contains much larger fish. This was very embarrassing for me and I felt really sorry that Andy had lost a fish because of (at least partly) my negligence. However, Andy did not mind that much about the trout which got away. He had already more achieved during this day than firstly he expected and secondly as I had told him about 7 hours ago while driving to the first creek. Andy and I enjoyed both a splendid fishing trip. 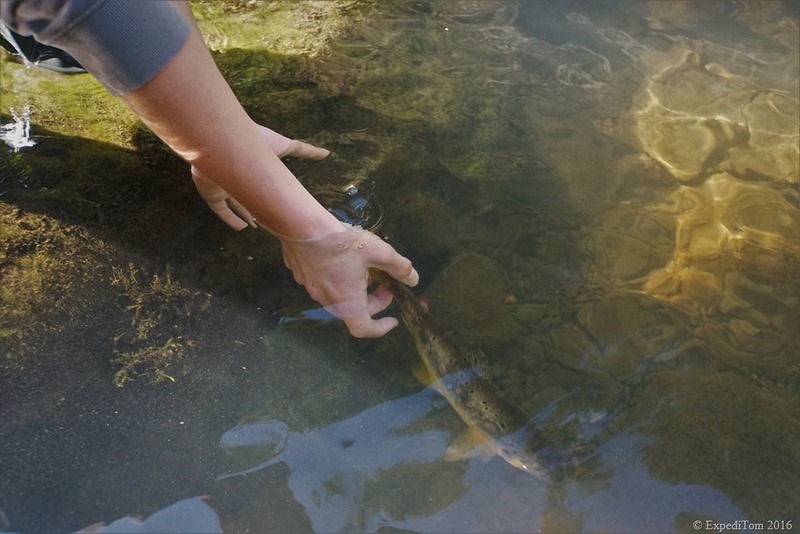 Not only did we venture along a small mountain creek where Andy caught his very first trout on a fly, but also did we find some decent sized fish later on. I experienced during this trip that the fish fed vigorously before the long cold period through winter, because we had heaps of takes. 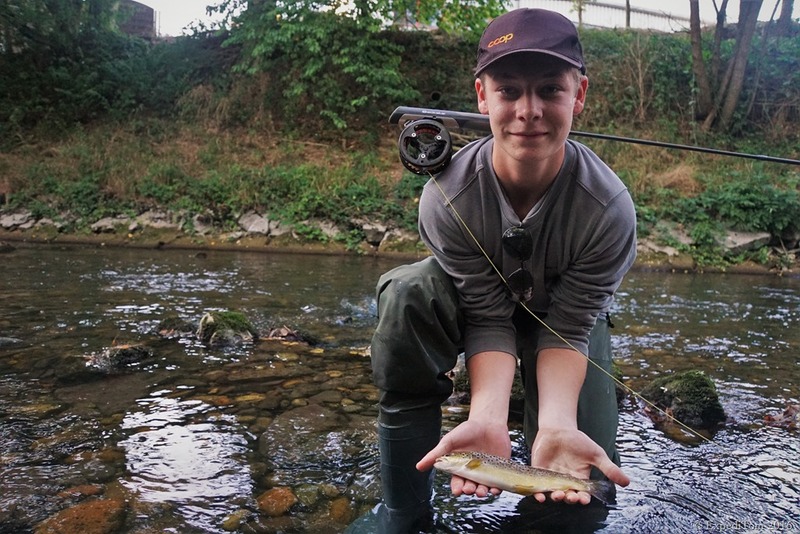 My favourite moment was when I caught the first trout on a dry in the Long Pool. Fishing with a dry fly is just the most intense fishery I have ever practised. Additional, I was happy to have shared another special moment in an anglers life: The first fish on a fly. 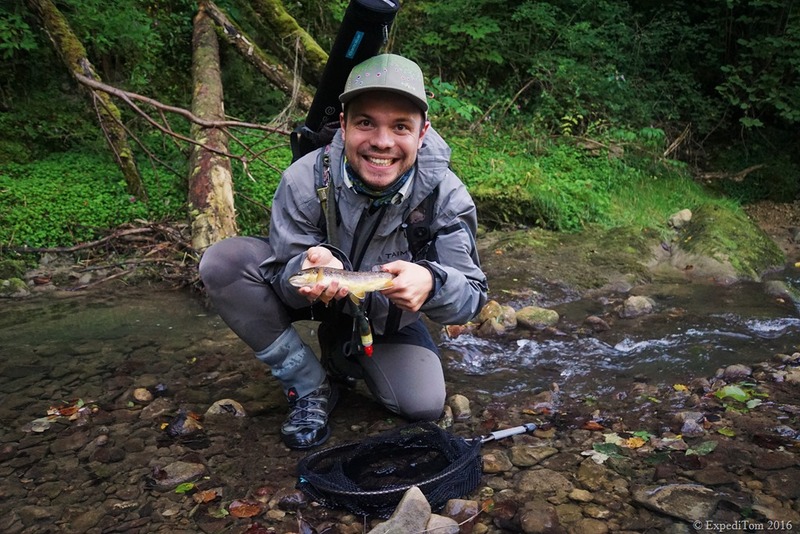 There is different advice from this guided fly fishing trip with Andy. The most important are that the further you walk the better the fishing gets. Moreover, always adjust the strength of the rig to the condition of the fish (everytime you change waters!). 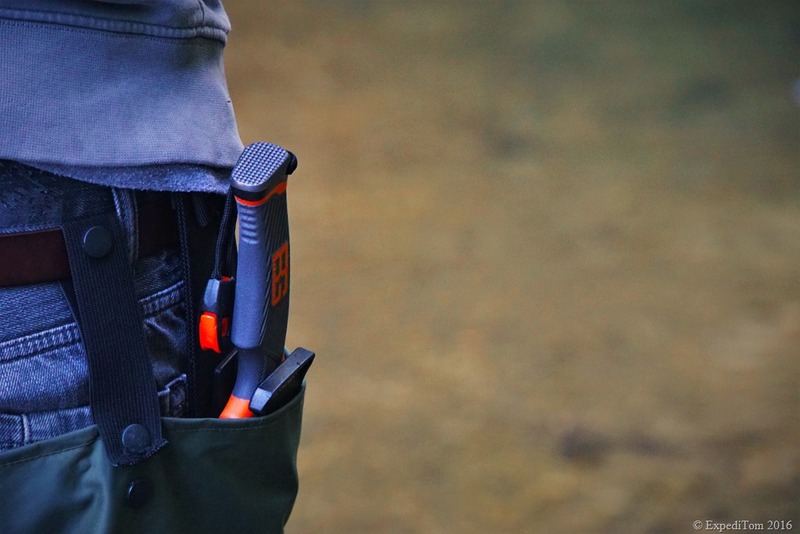 Furthermore, rigging 2 rods differently is very useful in small creeks where only one person can fish at a time. Thus, you can swiftly change rods instead of rigs to the preference of the fish. Thanks Andy for this great trip and I hope you will continue fly fishing!